Naloxone is a life-saving drug that temporarily reverses the effects of an opioid overdose. Within 1 to 5 minutes, naloxone can reverse slowed breathing. If you suspect an overdose, call 911 right away and follow the SAVE ME protocol while waiting for first responders, and administer naloxone if available. In conjunction with the rescheduling of naloxone, amendments have been made to the Health Professions General Regulation adding an “exception for opioid overdose” which authorizes all health professionals to administer emergency use naloxone (outside of a hospital setting), even when administering a drug may not be within their scope of practice. This means if a pharmacist or pharmacy technician suspects a person is suffering from an opioid overdose, they may assess and treat the person and administer emergency use naloxone by intramuscular injection or intranasally. Naloxone is an antidote to opioid overdose. Over using opioid drugs – such as morphine, oxycodone, methadone, heroin, or fentanyl – can slow or completely stop breathing. Naloxone has a stronger attraction to the brain’s opioid receptors than opioids, causing it to override these receptors, and temporarily reverse the effects of an opioid overdose for 30-90 minutes. When administered properly, naloxone restores normal breathing and consciousness within 1 to 5 minutes of injection, preventing death or brain damage caused by lack of oxygen. It is most commonly administered as an intramuscular injection. Naloxone has been used in Canada for over 40 years and is still one of the most valuable tools we have to mitigate BC’s opioid crisis. It has no effect on the body in the absence of opioid use, making it incredibly safe to administer and impossible to abuse. – World Health Organization recommendation. Over three quarters of overdoses are witnessed by someone. Evidence shows that with appropriate training, members of the public (such as friends and family of opioid users) can recognize and respond to opioid overdoses. Extended wait-times for Emergency Medical Services can have potentially fatal consequences, meaning that intervention from those close at hand can help prevent an opioid overdose from resulting in death. Tell attendant: Person is not responsive and not breathing. Follow the SAVE ME Protocol when responding to an opioid overdose. Emergency use naloxone kits come equipped with detailed instructions on how to safely and effectively administer the drug. In the event that naloxone is unavailable, confirm 911 has been called and provide rescue breathing until Emergency Medical Services arrive. *Naloxone does not replace the need for emergency care or minimize the importance of calling 911. Call 911. In the event of an opioid overdose, always contact emergency medical services immediately. Intramuscular Injection. The easiest and fastest way to administer naloxone is to inject the drug into a large muscle such as the upper arms, buttocks or thigh. Be patient and continue to ventilate. An injection of naloxone won’t elicit an immediate response. The antidote can often take upwards of 3 minutes to start working. While waiting, continue to ventilate by providing 1 breath every 5 seconds. Re-evaluate after 3-5 minutes and provide an additional dose if they are still unresponsive. After-Injection. 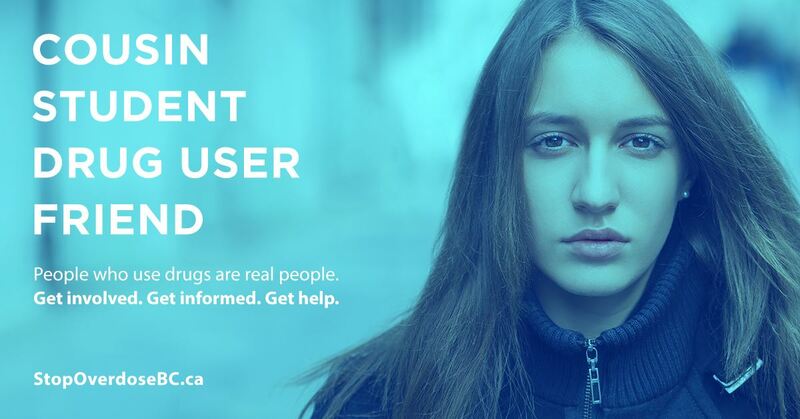 Victims are usually unaware that they have overdosed and could be confused. Keep calm and try to explain what has happened. The College, in partnership with the BC Centre for Disease Control, the Ministry of Health, and patient advocacy groups, developed an education session and resources for pharmacy professionals. The following resources are intended to provide more in-depth naloxone education for patients, pharmacy professionals and other health professionals. Training on how to use naloxone is important. Anyone administering naloxone needs to know to call 911 right away and be aware that naloxone may bring on symptoms of withdrawal. It also wears off after 30-75 minutes which means an overdose can return. The SAVE ME Protocol outlines the steps required in responding to an opioid overdose. The naloxone education session is available as a webinar for pharmacy professionals and the public. 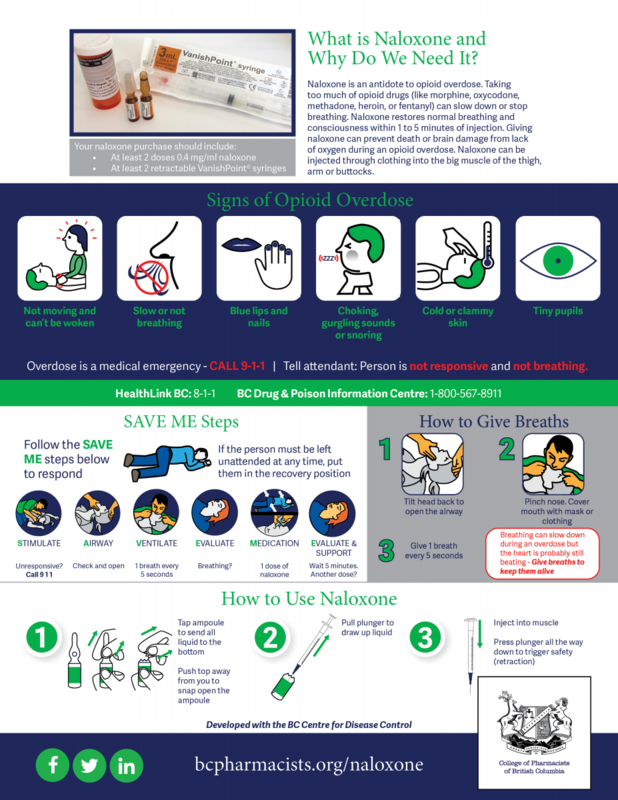 Pharmacy professionals can watch the session, review the slides and use the naloxone training checklist to assist them in providing instruction to anyone purchasing naloxone. Note: At the time the Education Session Webinar and Presentation Slides were recorded (April 2016), Naloxone was still classified as a Schedule II drug, and the webinar and slide deck reflect this. However, in September of 2016, The College of Pharmacists of BC changed the status of Naloxone for emergency use to ‘unscheduled,’ making it available anywhere to anyone. Education sessions were also delivered in April 2016 and were eligible for non-accredited continuing education credits. The training provided through the webinar and naloxone training slides are eligible for non-accredited continuing education credits. ​New Naloxone Training App developed by St. Paul's Hospital and Toward the Heart. 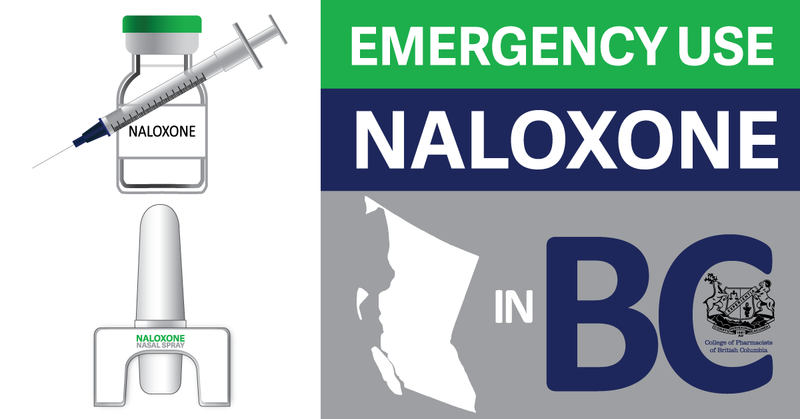 Take-home naloxone kits are available at community pharmacies throughout British Columbia. Pharmacists will provide these kits free-of-charge to people who use opioids or are likely to witness an overdose. Additionally, pharmacists will also provide training in overdose recognition and response. To improve access to this life-saving drug, pharmacists can now provide First Nations clients with both injectable and nasal naloxone and bill the drug program using their practitioner identification number. These changes came into effect in June 2016 when Health Canada’s Non-Insured Health Benefits (NIHB) Program and BC’s First Nations Health Benefits (FNHB) added injectable naloxone as an open benefit on the Drug Benefit List. For more information see Health Canada’s Pharmacy Benefit Policy. As part of the ongoing strategy to reduce harm from opioid drug use, the First Nations Health Authority now also includes Naloxone nasal spray as a benefit. Nasal naloxone is the same chemical compound as injectable naloxone. Both reverse the effects of an opioid overdose - the only difference being the delivery method. Nasal naloxone provides people with a fear of needles, or those living in communities where needles are stigmatized, with an easier option for responding to opioid overdoses. First Nations in BC may request both injectable and/or nasal naloxone directly from their pharmacy, free-of-charge by providing their Status Number and Personal Health Number. No prescription is required. Much of what we can do to help reduce stigma involves recognizing that the language we use matters. Negative, stigmatizing language, whether it is used in healthcare settings, news, or social media, discredits people with substance use disorders and can result in discrimination. The Ministry of Mental Health and Additions, the BC Centre on Substance Use, the BC Centre for Disease Control, health authorities and other organizations are all working together to help combat stigma, with a particular focus on its impact on the opioid overdose crisis. Recently the Vancouver Canucks hockey team and the Ministry of Mental Health and Addictions joined together on a new campaign that aims to save lives by eliminating stigma: Stop Overdose BC. Health professionals in particular can be a part of combating stigma by recognizing how our own attitudes and judgments affect how we think about and behave toward others and learning how to use respectful “person-first” language. 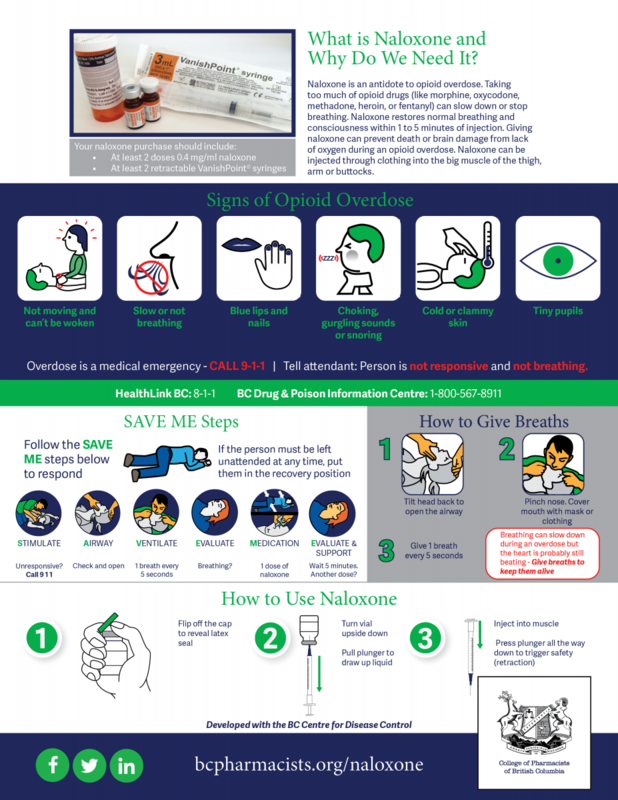 The naloxone educational resources above are available under the Creative Commons Attribution-ShareAlike License to use and remix as needed to help provide patients and pharmacy professionals with important information on the use of this life saving drug. Attribution should include: "Naloxone educational information included here was developed through a partnership between the College of Pharmacists of BC, the BC Centre of Disease Control and the Province of BC’s Ministry of Health."